Did you know that dogs have 42 permanent teeth – 20 on the top, and 22 on the bottom? Despite all those pearly whites, dental care is often overlooked by dog parents, and studies have shown that by the age of 3, 80% of dogs exhibit signs and symptoms of gum disease! Thankfully, something as simple as brushing your dog’s teeth can greatly lower their risk of gum disease. So, today we are excited to be checking out a few new tools designed to help you get the job done. 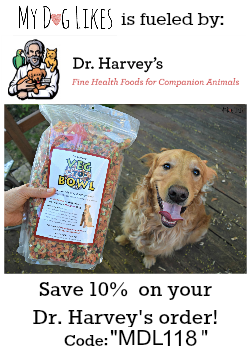 Waggletooth is sponsoring this post so that we can help spread the word about their innovative line of dog dental health products. 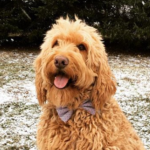 Waggletooth is a dog dental health care company (founded by a real dentist) that is committed to helping pet parents get proactive about their dogs oral health. Veterinary dental procedures can be expensive (and risky) so they believe that the more routine maintenance done at home, the better. A buildup of food particles and bacteria along the gum-line can turn into plaque. This in turn leads to an immune response which can cause damage to the gum tissue. Waggletooth is not your standard shaped dog toothbrush. Instead it is designed to slide over your finger and has 360-degree bristles on the exterior. It is made from TPE (BPA-free, FDA-compliant), non-toxic dye and is bite resistant. If you have ever tried to brush an uncooperative dog’s teeth before you understand that this is particularly important! Waggletooth’s unique finger cot design is intended to give you more control over the tooth brushing process. 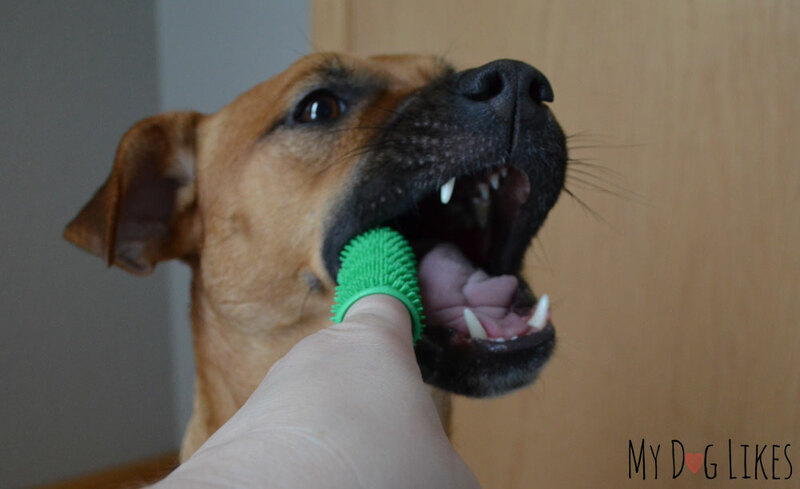 Being right on your finger makes it easy to control the amount of pressure you are applying and help you judge exactly where you are brushing in your dog’s mouth. The 360-degree bristles also ensure you are brushing all the sides at the same time, making the cleaning process much more efficient. Waggletooth’s toothpaste comes in a 3 ounce container, is unflavored and made with human grade ingredients. It’s formulation helps maintain clean teeth and gum health. First, place the Waggletooth Toothbrush on your finger. I found using the pointer finger on my dominant hand worked the best. Finally, with your other hand raise or lower your dog’s lip and begin to brush. Before brushing both Spencer and River, I let them smell the brush and toothpaste first. I went at their pace and didn’t “fight” them to do a specific spot. Continuously moving the brush around worked the best. After use, simply clean the toothbrush with warm soapy water. 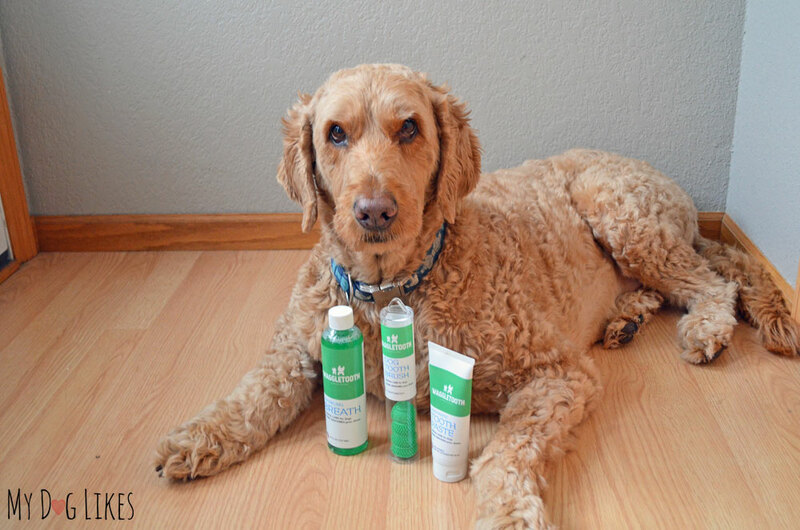 Waggletooth recommends using a different brush on each of your dogs. Change your brush every 3-4 months or at the first sign of wear and tear. Waggletooth Sparkling Breath is a water additive designed to help reduce bad bacteria in your pet’s mouth. It comes in an 8 ounce container and is mint flavored. 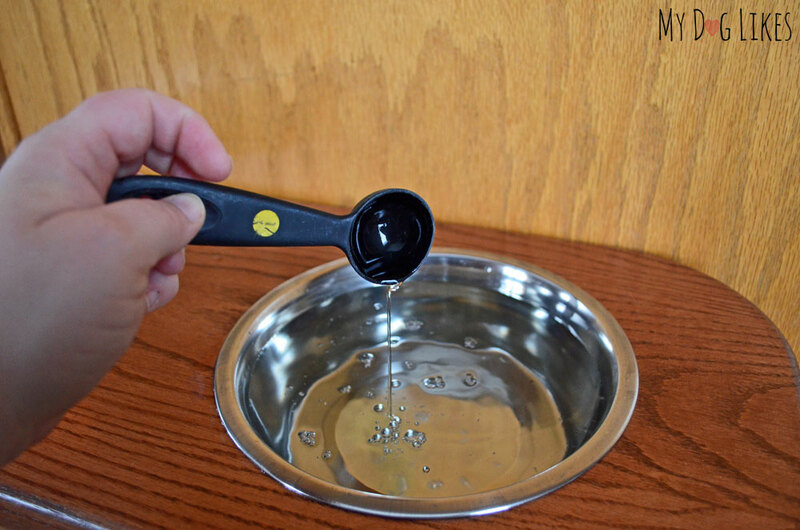 Simply add 1 tablespoon to your pet’s water bowl for fresher breath! What Did We Think of Waggletooth? The Waggletooth Toothbrush was extremely comfortable and fit my finger with ease. I was unable to bend my finger and could feel the durability of the brush. I liked that the Waggletooth Tooth Paste was unflavored with no detectable smell. The paste came out of the container smoothly and I was able to spread it around the brush easily. Brushing both Spencer, who is 10 years old, and River, who is 2 years old, was surprisingly quite easy! Normally I don’t brush their teeth, so this was a new experience for both the dogs and I. Neither pup resisted or fought this new process. Instead, River wanted to lick the brush the entire time which made moving around her mouth easy. Spencer just sat there and allowed me to brush his teeth without any problems. Since, I only had one Waggletooth, I washed it off between uses. I was actually just going to brush Spencer’s teeth for this dog toothbrush review, but River wanted to join in the fun! Washing the brush was quick and easy. I simply used a little soap and water and was able to clean between the bristles with ease. 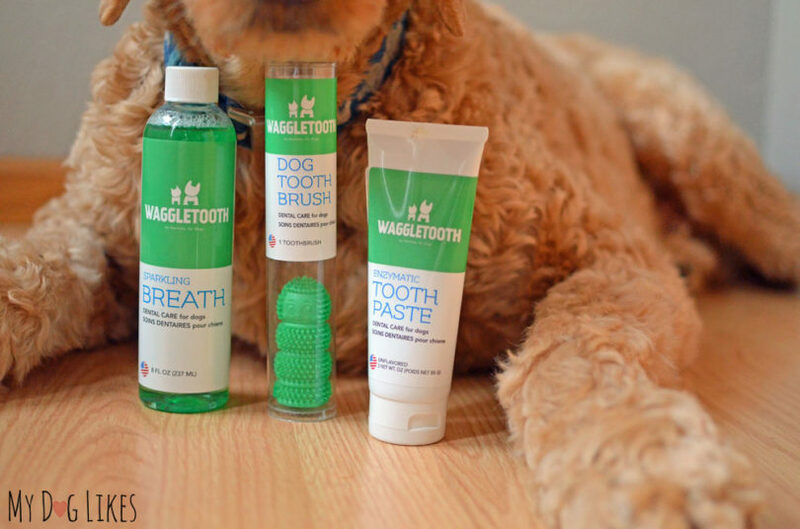 The Waggletooth Sparkling Breath is a really easy way to help your dog if they have bad breath. When filling up their water bowl all you need to do is add in the solution and it goes to work. Although we do get Spencer and River’s teeth and gums examined at their annual Vet check ups, I must admit that we were not doing much prevention at home. 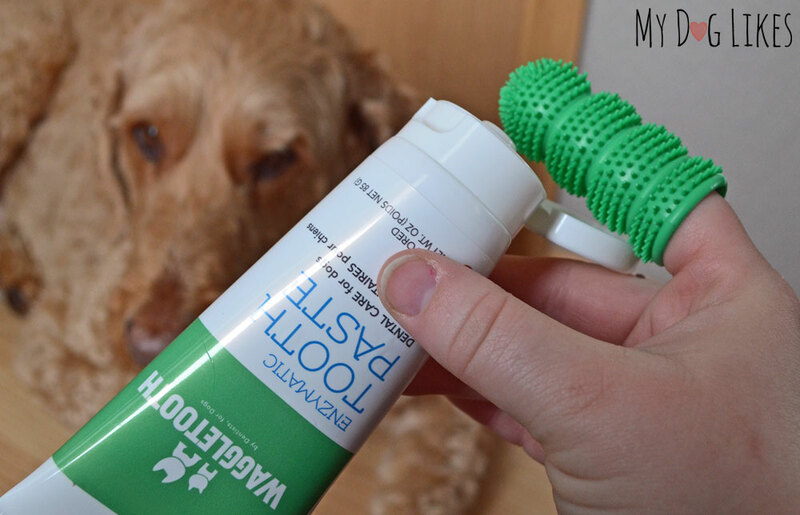 I was pleasantly surprised at how well both dogs took to the teeth-brushing process and found the Waggletooth line easy to use and efficient. I love that these products are made by a dentist as well. Just like humans, if we don’t maintain our dog’s oral health it will cost more in the long run. The best part for me, however, is that River finds getting her teeth brushed to be a fun experience! Want to try out the Waggletooth line for yourself? I’m a slacker. We only brush weekly. But I do give them thorough dental cleanings monthly. Not often enough! About weekly. I shoot for every other day, but that doesn’t always happen. i brush my girls teeth everyday, my dental vet insists. i travel 180 miles to see him every 3 mos or so. my girls have had gum graphs, fillings, root planing, etc. he recently told me to get a sonic toothbrush, but the girls did not like the noise. the company that makes this product is in chapel hill, nc, not far from me. I really don’t brush my dog’s teeth that often because he absolutely HATES it. He thinks I’m torturing him and it’s so frustrating! I’d love to try this. It looks like it would be easier to brush his teeth. We barely brush my dog’s teeth but they’re starting to show it. Keeping up with his dental care is one of my new year’s resolutions. I brush Sadie’s teeth almost everyday. She gets really bad breath! I brush their teeth almost daily. Very impressed that you can manage a nightly routine with that crew! Good luck, Jill! I am not a brusher even though I should be one. These products would definitely encourage me to brush all the dogs’ teeth. I like the water addictive too. just once a week, but use lots of DentaSticks. Sadly, only a few times. He didn’t like the toothbrush. This one looks like it might work for us though. I don’t brush my dogs teeth often, usually only when she eats certain food or treats or if she gets into anything like dirt from outside but this would make it much less of a hassle and I’d do it more often. I don’t brush my dog’s teeth nearly as much as I would like. About once a week. Hopefully, she would enjoy this much better than what I currently use. I have never brushed my dogs teeth. I give them bones to chew because I thought that bones help keep their teeth clean. I’ve tried brushing my dog’s teeth a few times but as it didn’t work, I stopped. It found it difficult to angle the brush but the waggletooth sounds so much easier to control. 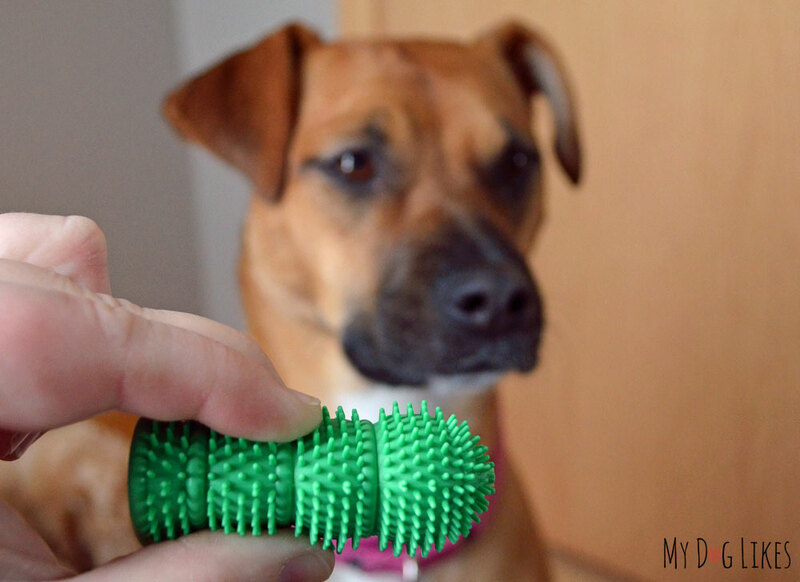 How often are you supposed to replace your dog’s toothbrush? I feel like I don’t do it enough. I try to brush my dog’s teeth every day. She lost several teeth in a dental cleaning when I first adopted her & needs to keep the rest. Our new dog is only 11 weeks old so we have not started brushing yet but I plan on it. We were very lucky with our last dog he had really really good teeth everyone commented on how white they were. I don’t brush his teeth often and I know to be effective it should be done daily; hence we have to get his teeth vet cleaned yearly. I would like to brush our dogs’ teeth because they really need it! Hi William – try clearing your browser cache and re-loading the page. The widget shows up for me and I just checked and we have been getting hundreds of entries all night. I feel horrible saying this, but I rarely do. Tucker had no teeth left so for years I didn’t have to with him… and Abby just never has been keen on it. I wonder if she’d allow this a little more. I’d honestly brush my dogs’ teeth daily if they would let me. I have yet to have a dog who cooperates, so I’m always looking for new ways to get them to brush. I brush at least 3 times a week. They also get dental chews daily. I try to do my 2 dogs every other day. I use enzyme wipes, weekly … should do it more often. About twice a week he gets his teeth brushed. We took our dog to the Vet to have them cleaned as he doesn’t like us to. My dog gives me such a hard time when I brush his teeth, but I’ve never tried a toothbrush like this. Maybe it would help! Yes, and safer! 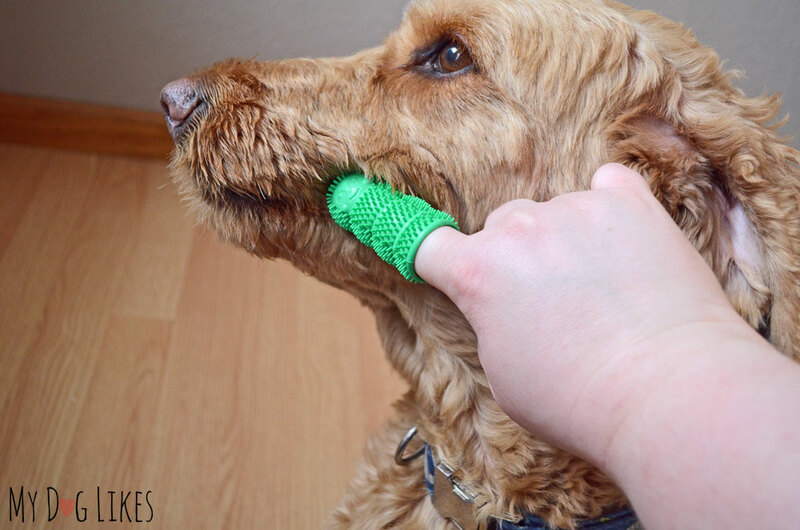 This thing is bite resistant in case your pups get a bit overzealous! Never, because both of them will fight you tooth and nail if you get near their mouth. Maybe this would help make it fun for them. I didn’t know that you got a dog! How exciting! Definitely let us know if you have any questions or are looking for recommendations. I have been trying to brush my dog’s teeth daily, but sometimes I only do it once a week. But my vet said that my dog has great teeth so that’s good! I hardly ever brush my dogs’ teeth, but that needs to change. I don’t do it & they need it so badly. I need to have their teeth cleaned at the vets, but I am afraid they might not wake up. My dog hates when we try to brush her teeth. 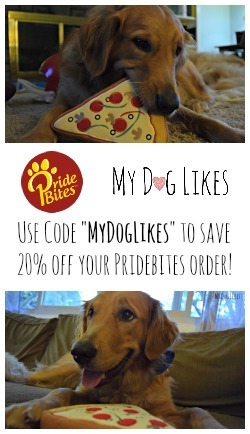 We give her dental chews and bully sticks, so she could definitely benefit from something like this. It seems pretty innovative too! I just acquired my son’s dog. He was in need of a vet. Poor old dog, the vet said the only thing good he had going was his teeth. I would like to keep them that way. His health is failing in other ways. I told him to consider our home his retirement home. He is already part of the family. So kind of you to take him in, and it sounds like he will be very happy with you! I brush Phoenix’s teeth every week but he really fights the brush. I do not brush his teeth nearly as often as I should be. my dog gets dental treats and bones but i hardly ever brush his teeth. i need to be better about that! My wife brushes our dogs teeth 3 times a week. We haven’t been good about it at all. We really need to start. I don’t really brush my dogs teeth, I know I need to do it, but they hate it. I honestly don’t brush my dog’s teeth. My dogs don’t want to cooperate so i get teeth cleaning treats and toys. They work well. I probably only force them to be brushed once a month or so. I try for weekly but they don’t like it so sometimes it’s not that often. I have to be honest in saying that I never brush my dog’s teeth with the exception of their dental appointment at the vet, which is quite an expense. This doggie toothbrush would be awesome to have on hand so I could do the job myself. It sounds like your dogs did not seem to mind, so that is very promising! I used to do it on a regular basis, but have gotten out of the habit. I need to get in the habit again! We have a hard time with brushing Bailey teeth. He hates it and I try to brush his teeth once a week. She gets a Greenie a couple times a week and occasionally I give her teeth a wipe with a wet paper towel. I’m trying to be more regular with the paper towel. She’s freaked out by toothbrushes for whatever reason. We brush our dog’s teeth once a week and he also chews on dental treats. This is so cool, I think it’s so important for dog owners to spend more time on their dog’s dental health – it’s just as important as a human’s. 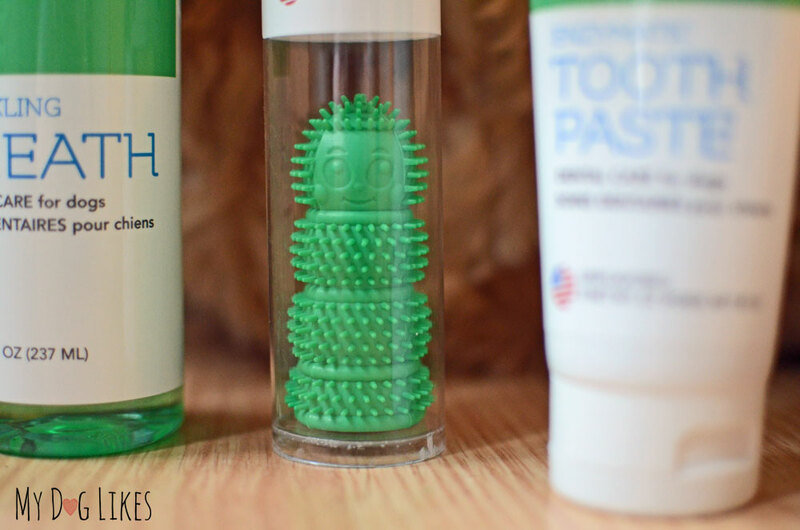 We’ve never use a brush like this before, but we do use other dental products and treats.